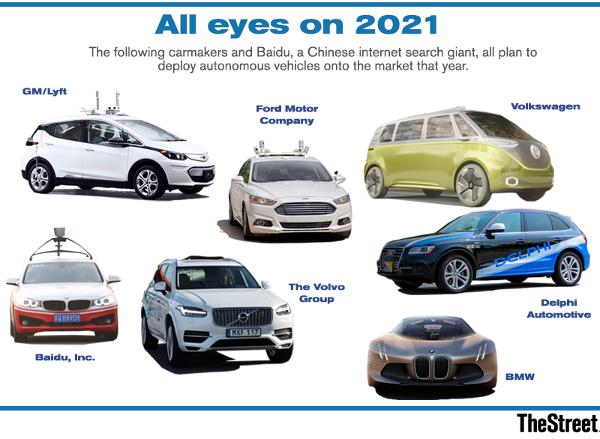 While there will be setbacks in the self-driving car space, Alphabet's Waymo, GM and others will continue to pursue the full potential of autonomous vehicles. Unfortunately, there's been a fatality involving a self-driving vehicle. The accident occurred in Tempe, Arizona where 49-year-old pedestrian Elaine Herzberg was struck and killed by a self-driving Uber vehicle. While condolences are offered to Herzberg's loved ones, many say this type of tragedy was bound to happen eventually. Perhaps my view on self-driving cars is skewed because of how much time I have spent covering the various technologies and companies behind it. Most recently, I was able to sit down with Danny Shapiro, the senior head of automotive at Nvidia Corporation (NVDA - Get Report) . Shapiro told me that Level 4 and Level 5 driving capabilities are very close to reality. In fact, the biggest hurdle to this achievement is computing power, a problem that's being relentlessly worked on with each passing day. It won't be long before, at least from a technical perspective, self-driving cars are capable of driving on our roads full time. Following reports of the accident, though, I was surprised to find just how many people believe that self-driving cars are a bigger danger to society than human drivers. While autonomous cars are not perfect, the data doesn't lie. That data tells us that self-driving cars are vastly more safe than human-controlled driving. As an aside, humans are responsible for more than 90% of all accidents, according to the National Highway Traffic Safety Administration. As Shapiro said, "We need to decide, how much safer than a human is acceptable." Is it 10 times safer? 100 times? "[We are] working with our customers to now train these neural nets to be robust enough so that we can handle situations much, much more safely than any human could drive," he added. So there will still be accidents, but if we can cut them down significantly, why shouldn't we? To get a better sense of the data, TheStreet's founder Jim Cramer dug into the records from the California Department of Motor Vehicles. Speaking on CNBC's "Mad Dash" segment, Cramer noted that Alphabet's (GOOGL - Get Report) self-driving car segment, Waymo, has logged some 352,000 miles on the road with its driverless technology. Because of California's strict rules regarding self-driving cars, companies in the field have to file a number of reports to the state. One of those reports is on disengagement, or how many times a human driver must take control of their self-driving vehicle. Of the 352,000 miles that Waymo has logged, there were only 5,595 disengagements, or once every 62.9 miles. General Motors Company (GM - Get Report) and its self-driving Cruze cars had 1,245 disengagements in the 131,000 miles that it's logged, or once every 105 miles, Cramer noted. "This data is very eye opening because it's clinical," Cramer said. It can be studied and it can be applied to the real world; it's tangible, he reasoned. In 2016, more than 37,000 auto fatalities occurred in the U.S., up 5.5% from 2015, according to the National Highway Traffic Safety Administration. If we had this many fatalities in any other industry -- say the airline industry -- there's no way overhauls wouldn't be on the way, argued Cramer, who also manages the Action Alerts PLUS charitable trust portfolio. Self-driving cars may not be perfect, but if they can reduce the U.S. auto fatality rate by 50% or more, why shun its potential? That's why companies like Alphabet, GM and others will likely continue pursuing its potential. At the time of publication, Cramer's Action Alerts PLUS had a position in GOOGL and NVDA.